Festivals where food and drinks are the star can often lead to a lead the kids at home kind of environment. 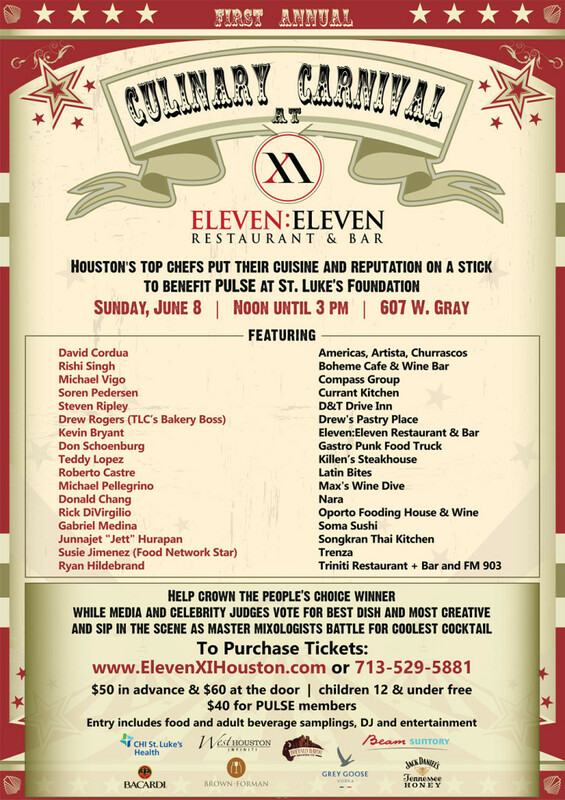 This weekend I am looking forward to attending an exception to this rule in the Culinary Carnival at Eleven:Eleven. The food and drinks for this festive event will be tempered with face painters and carnival games to encourage a whole family Sunday Funday. What better way could there be to celebrate the start of summer break than bringing the kids along to participate in some of the fun. The food itself will be incredible with some Houston powerhouses showcasing their skills including David Cordua from Americas, Kevin Bryant from Eleven:Elven and Ryan Hildebrant from Triniti just to name a few. For more grown up fun there is a battle for coolest cocktail to help you beat the heat this summer. Best of all the proceeds benefit Pulse at St. Luke’s Foundation. All in all the festival give you a chance to have your cake and eat it too when deciding between adult and family fun this Sunday!